The prominent two-year-old colt, QR MARC, bred in the U.S. and owned by Rohara Arabians, USA, was recently sold to Europe. Spectacular rumours on a spectacular price have been going around since the end of September. However, it is a fact that this excellent colt and young stallion has been sold to Europe, to Paul Gheysens of Belgium who starts his breeding programme on sire's side with QR MARC. The stallion will be professionally managed by Christine Jamar, from Belgium, assisted by Greg Gallun, in the USA. 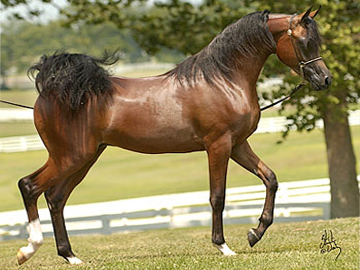 QR MARC is by Marwan Al Shaqab and out of a full sister to stallion QR Excel, who came over to Italy in the beginning of the 90s, and was sold and owned later on by Yeguada Ferrero in Mallorca. 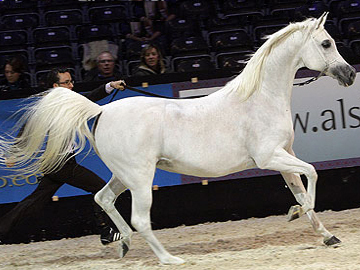 QR MARC will be based at Christine Jamar's Jadem Arabians, in Belgium, and will be available also for outside mares.